We left Yabuhara Station via an underground walkway (a narrow slope was built into stairs wide enough to allow a person to push a bike), which brought us to the other side of the train tracks. From there we entered Yabuhara post town. During the Warring States period (circa 1467-1568), Yabuhara was one of 11 post towns ruled by the Kiso family. After the commencement of the Edo period and the establishment of Nakasendo it became the 35th post town from Edo along the highway and was popular as a resting place at the foot of Torii Toge. In addition to those travelling along the Nakasendo, people heading for Takayama in the Hida region via the Hida highway also stayed there. It is said that at the time Yabuhara was home to the largest honjin along Kisoji in addition to 10 hatago (high class inns), however these were destroyed in large fires in the Meiji period (1868-1912). 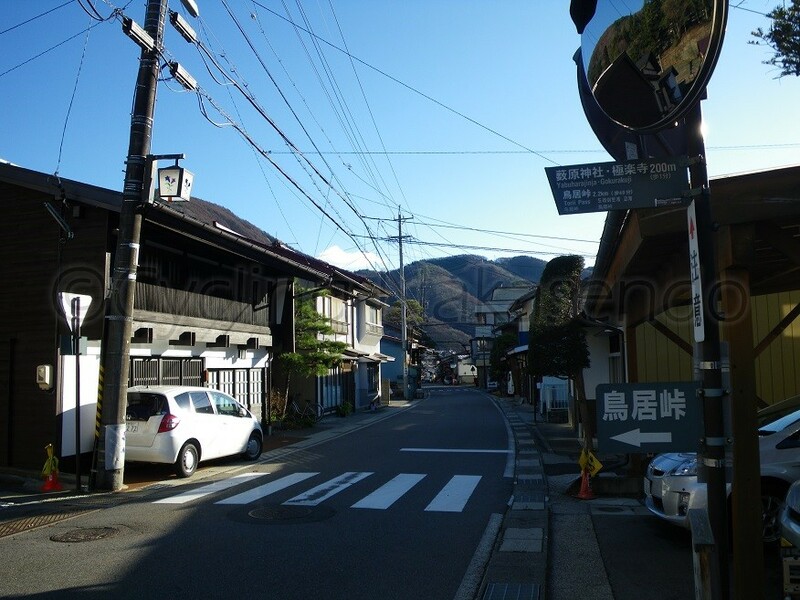 While the modernization of Yabuhara’s buildings has progressed since then, the atmosphere of the traditional village is still present. From the Edo period Yabuhara has been well known for Orokugushi, wooden combs made from Japanese cherry birch and continue to be sold from one or two of the older stores in the area. They appeared to be closed so we continued on past them without stopping. As it was a sunny autumn day and a Sunday, I had suspected there would be few tourists in this area, however, that we didn’t see even one was surprising. 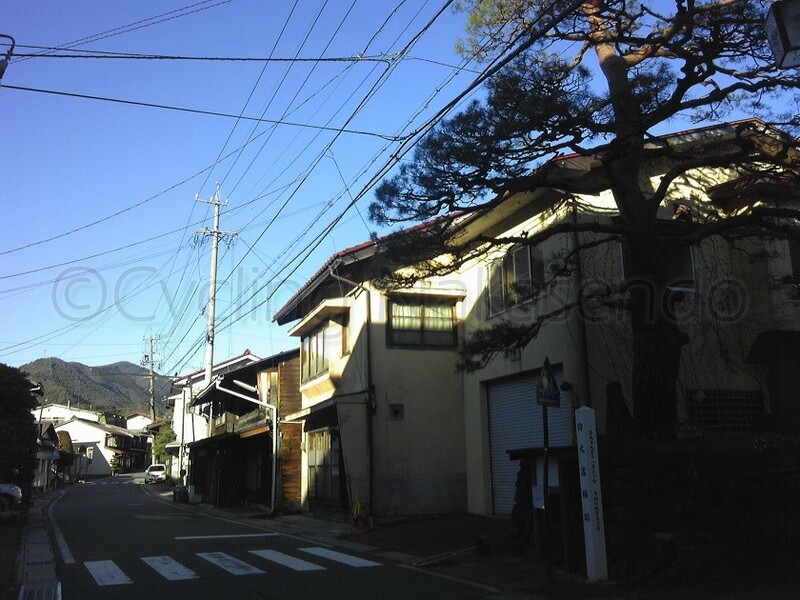 Yabuhara has not been preserved to the same extent as other traditional post towns along Nakasendo. Compared to Magome or Tsumago, which are featured in guidebooks, enjoy varied media attention and are often included in sights visited by group tours, Yabuhara is a different world. Post towns cannot be defined as individual entities. Rather, it is the road that threads through them that completes them. I feel that ignoring this is like eating a course meal without consuming the main dish. Foundations of a firewall that separated the northern and southern areas of Yabuhara still exist. Reinforced mud walls were constructed after large fires in 1695 as a fire prevention measure. Details such as these indicate the extreme risk fire presented to those at the time, given people lived in wooden houses packed closely together, and show the extent taken to protect their homes and livelihood. After passing the remnants of the firewall we came to a sign on the right that directed us towards Torii Toge. If you continue without turning right along the original route of the Nakasendo, you will reach Komeya, which was established in 1613 (rebuilt in 1884 after the original building was destroyed in a large fire) and is the only hatago still in operation in Yabuhara. 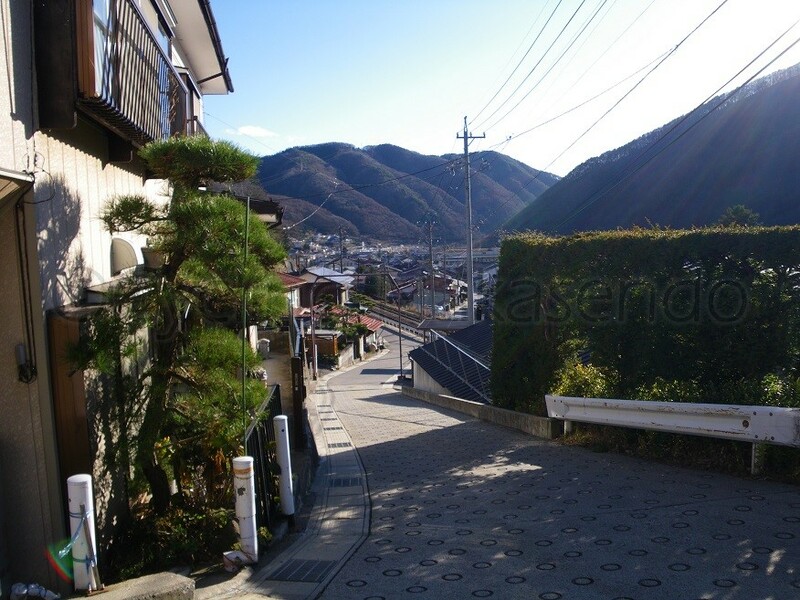 After passing the ruins of the town’s honjin, Nakasendo is divided by the Chuo Main Line. It is possible to cross to the other side of the train tracks via a footbridge however for bike travelers it would mean carrying one’s bike up a steep flight of stairs. We followed the directions on the sign for a section of the road that passes under an elevated section of the train tracks. Upon coming out on the eastern side of the tracks we could see a dramatic uphill stretch of road. From this point all roads going upwards lead to Torii Toge’s summit. 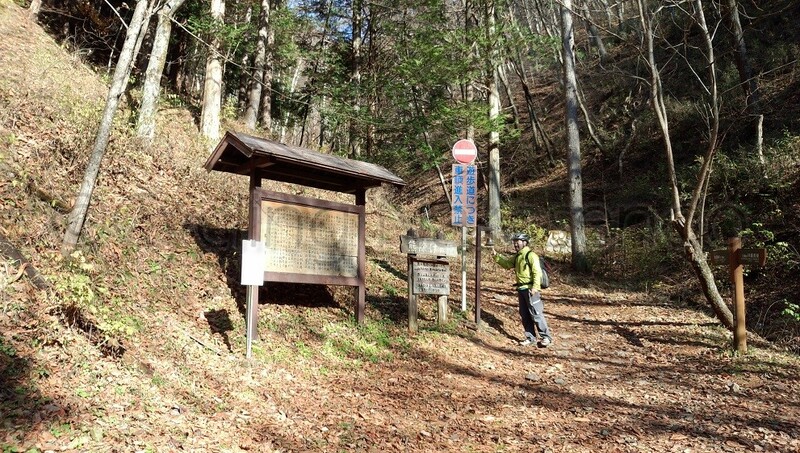 The route hit the Hida Highway junction from the point the path changed from asphalt to concrete, however what remains of the Hida Highway to the left is only wide enough for one person to walk along and would be easily overlooked if it weren’t for signs and explanations of the road’s existence being posted. 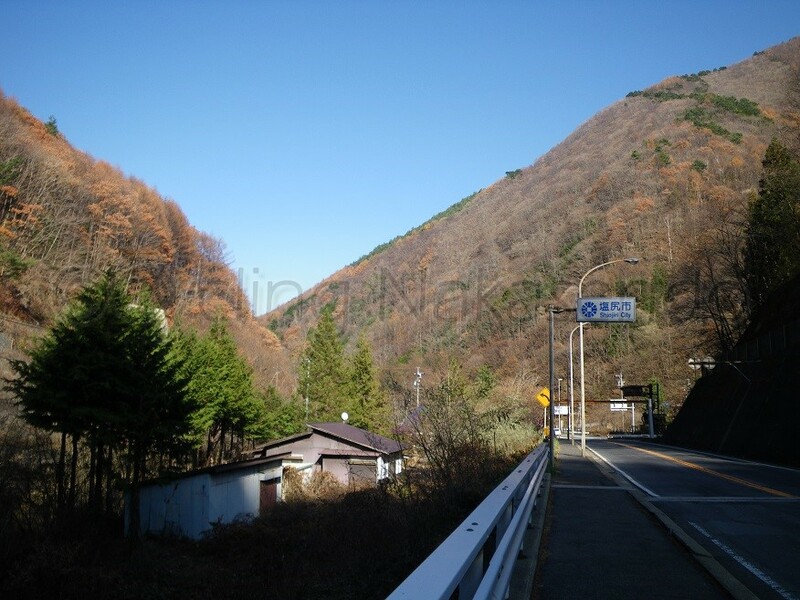 From this point the Hida Highway became a mountain trail that runs over several extremely steep mountain passes to Takayama and then leads to Shirakawa-go, a famous world heritage site. A little further up from the junction were the site of a falcon master’s office. In the Edo period falcons were a symbol of power and owning them for hunting was restricted to Shoguns, authorized Daimyo and relatives of Tokugawa in Kii, Owari and Mito provinces. This falcon master’s office was used to train Owari Daimyo’s hunting falcons. When we looked back from where we had come, a clear view of Yabuhara and the train line cutting across Nakasendo was visible. The route curved to the right in front of the falcon master’s office and abruptly became steep (with an average gradient of 11.4%). I changed to the lightest gear and pedaled hard. As the number of houses along the steep incline decreased we eventually reached a stone monument with the words, “Right, National Route”, “Left Nakasendo” carved into the stone. “Right, National Route” (Route 19) was probably referring to Torii Tunnel. From Yabuhara we still had 11 km to go. I was a little worried about time and food given we still had more than 3 km of uphill riding before us but we continued on the Nakasendo. After passing an intersection on the route we entered a forest and the ground became soft with fallen pine and cypress needles. 300 m past the intersection, stone pavement appeared and we came to a large sign that said, “cars are prohibited from this point for the benefit of hikers” and an information board. 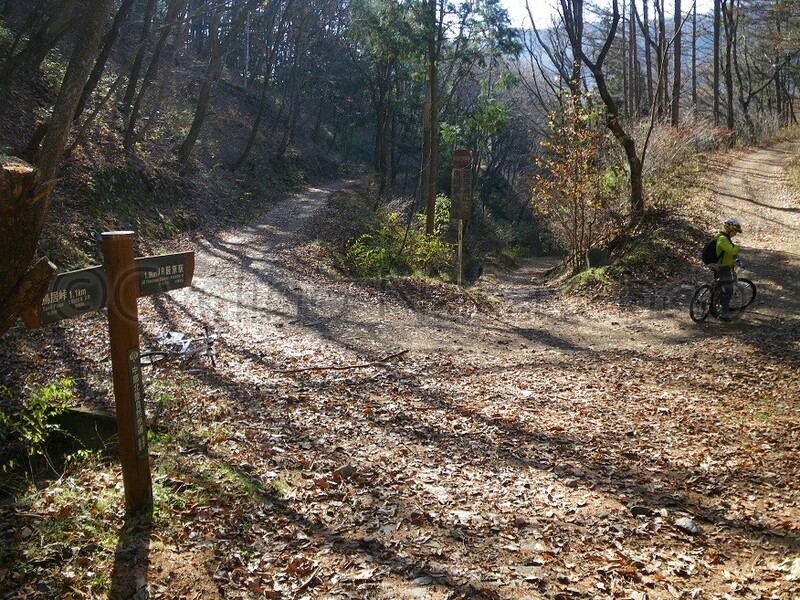 Although pushing a bike along tracks such as these is permitted, it is grueling work so we decided to take another route along a road that curves widely to the right that was constructed in the Meiji period. This one-lane road was constructed as part of the National Route for cars to cross the mountain pass before Torii Tunnel was opened. The sign we had passed earlier included the warning “Beware of Bears”, so going forward was pretty nerve-racking. You would think that it would be possible to get hold of a bear bell at a souvenir shop or somewhere else in Yabuhara but we had no luck. Either the shops we went to didn’t have any or the shops that did were shut. Our only option to deter bears from coming near us was to speak loudly, or yell out. For instance, “This climb is killing me! !” or, “I’m too old for this!” We proceeded upwards through a series of wide switchbacks winding left to right, that while being quite steep in places (10.2-13.8%) were constructed to make the climb less severe Just when we thought we had come to the end of the steep section the sealed road ended. I have to admit that the road up till now had been made easier to climb than if having to go straight up the mountain, but the gravel path created some resistance and made it difficult to increase speed. It was particularly difficult for me to keep the speed up on my foldy. 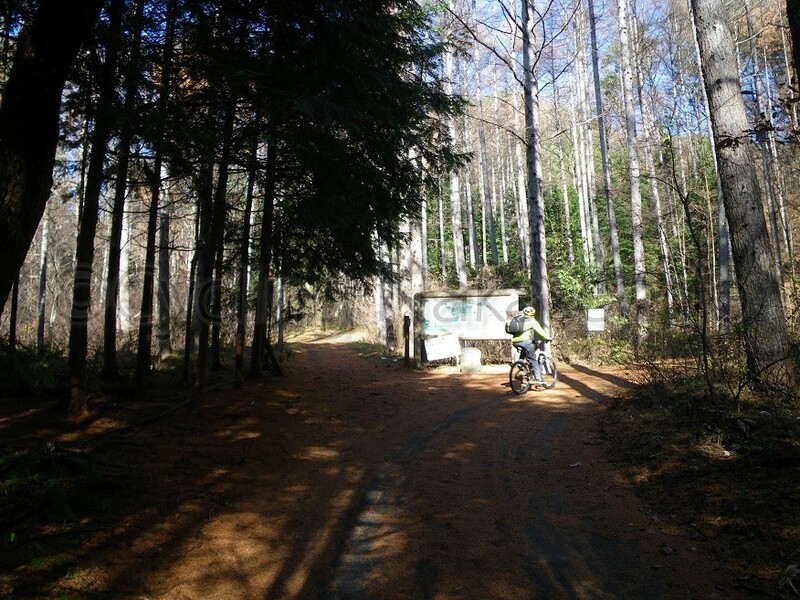 As the tires on the bike are small, riding over the gravel was bumpy which slowed me down considerably meaning we were travelling at about 6-7 km/h only. 530 m on and a 37 m climb from the stone pavement junction, we intersected with the original Nakasendo trail, which traveled along a valley. We came to another sign that said, “cars are prohibited”. It also had a large bear bell (gong) attached to it and the explanation, “It is unlikely that you will encounter a bear but just to be sure, hit the bell and take care.” So, we hit the bell numerous times and continued on with the 2.2 km climb to the summit, yelling as we went. Despite our initial fears, after about 300 m we started to get used to our surroundings and relax a bit when we heard what sounded like a growl. We both looked around us but couldn’t see where the noise came from. Just as I was wondering whether it could have been trees creaking, we heard it again. This time the noise was closer. It was definitely an animal growling. In an instant NC and I looked at and asked each other “Did you hear that? What was that?” Silence hung in the air for only seconds before I said “Run!” and at lightning speed we spun the bikes around 180 degrees and belted back down the hill. There is the possibility it could have been something other than a bear. It could have been a wild boar, or a monkey. Either of them would also be dangerous but the idea that it could be a bear meant a red alert was going off in my head. I once heard something interesting about bears. Apparently their bone structure makes it easy for them to climb trees and hills, so they can run up inclines quickly but they find it difficult to run down slopes. Tsukinowa Bears, which inhabit the main island, Honshu, in Japan are small compared to other bears, measuring between 100-180 cm in height and about 50-150 kg in weight. They can run over 50 km/h, so if we did have the misfortune of running into one and it was able to catch up to us on a downhill ride, it is feasible that it could claw us to death from behind. NC was riding a cross country mountain bike, so even when riding off road, it would be possible to ride as fast as a really angry bear if one made an effort. Even though the foldy is a good quality bike, it is still only a foldable bike. If I went too fast it felt as though the frame or the fork of the bike would break but given the situation I wasn’t chilled out enough to calmly pedal at a “sensible” speed. I didn’t even have enough time to check behind me. Put another way, the prospect of looking behind me was frightening. I descended as fast as I could while my bike vibrated like a jack-hammer. My bike was vibrating so much that just as I felt I was gaining on NC my bike chain came off the chain wheel. Cursing and freaking out I looked behind me. Thank god, nothing was chasing us. If it had,I would have been done for. I fixed the chain and quickly continued down the hill. NC was waiting for me below worrying whether I was okay as she had lost sight of me. Now that we realized nothing was chasing us we started to relax and carefully continued on, taking care not to slip on the fallen pine needles until we reached the asphalt road and finally the stone sign. What had taken us 15 minutes to climb seemed to take only 3 minutes to come down. But neither of us felt cheated by the fact we had wasted all that time climbing up the slope. We were just thankful to be alive. At the time we decided that we had probably heard a wild boar or a monkey but since then when talking about it to an innkeeper in the local area, he felt that it would have been a bear. Now it is a funny story but at the time I was really grateful that were lucky to get away. The months Tsukinowa bears hibernate does vary depending on the climate of the region they are in however, generally they hibernate for the winter between December and April. It was a little early for them to be hibernating when NC and I rode along Nakasendo but also, I remembered that the summer of 2013 was extremely hot meaning that a lot of the trees were burnt by the sun and didn’t produce much fruit. Because of that it was likely that bears had not been able to eat enough food to sustain them for hibernation. Without debate we decided to resume our journey via riding through Torii Tunnel. 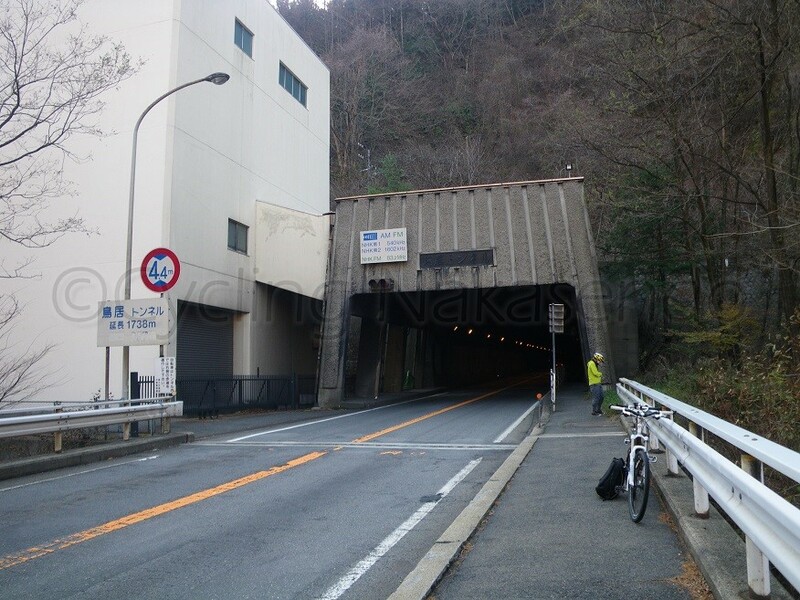 In 1955 the old 1111 m Torii Tunnel was opened however unfortunately this was eventually shut down. The current tunnel was built in 1978 and runs at the foot of Torii Toge, at an altitude of 1000 m and measures a total distance of 1738 m. We continued into the tunnel following the directions on the sign at its mouth that stated, “in the interest of safety we ask that all bike riders ride along the side footpath in the tunnel” It made sense, if there wasn’t a footpath it would be very dangerous to ride in the tunnel. As the tunnel was constructed according to old building standards, there wasn’t much room for bikes. The footpath was wide enough for one bike only with a fence separating the footpath from the road to provide extra protection but even then it was scary when large trucks came hurtling past. The other thing was other than a short distance at the beginning and end of the tunnel we were depending on the lights of traffic to see, otherwise riding in pitch dark. Our bodies were pulled sideways from suction created by passing trucks and it took all of our concentration to ride straight and not bump into the wall or the fence. It is possible that we were concentrating so hard that we had forgotten to breathe. Neither of us had the luxury to complain about the bad air. The ride to the end of the tunnel felt long but once it we arrived at the end I knew Narai village wasn’t far at all. We had crossed over Torii Toge, the mountain pass that divides the Japanese sea and Pacific Ocean sides of the country. Finally we had reached the much awaited downhill stretch of the mountain. From the tunnel we came to the first decent 1.4 km long downhill slope of the day. It took no time to go down it and after crossing the bridge over Narai River we arrived safely at Narai’s carpark for tourists. The time was just past 1:30pm, and according to my odometer, we rode 25.9 km from Kiso-fukushima and had climbed 390m (cumulative elevation gain) over the day.